PAD Presence-Absence Switch - HiTECH Technologies, Inc. The HiTECH PAD “Through-the-Wall” sensor is a presence-absence switch that detects the presence of materials based on a frequency shift of the sonic signal it applies though the media. The PAD is mounted external to the plastic tank or pipe and located at the point where the detection of the media is required. 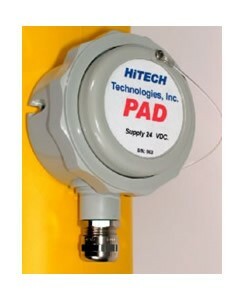 The HiTECH PAD is the ideal sensor for overflow prevention and/or run-dry protection for your tank or pump. This revolutionary system was developed and field proven in Europe. Now available in the USA, exclusively from HiTECH, this proprietary approach that we call “penetrating pulse technology”, enables “Through the Wall” level measurement. The basic measurement principle is easy to understand. The transducer emits a brief penetrating acoustic pulse. This pulse is transmitted through the wall of the vessel into the pipe. The unit monitors the pulse transit time, which is different for gas and liquid, and then provides a signal indicative of materials’ presence or absence. Amazingly, media measured can be abrasive, corrosive, toxic, and/or contained in a pressurized vessel even at high temperatures. This methodology also eliminates concerns regarding vessel integrity, contamination, or sensor wear.